The Next-Generation Large Canadarm is a 15-metre robotic arm which is able to collapse and fit onboard future smaller spacecraft. 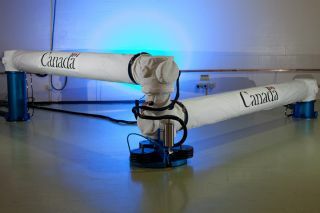 Canada has developed a new version of its famed robotic space arm to give exploration of the final frontier a helping hand. The nation's Next-Generation Canadarm (NGC) program is designed to support both missions in low-Earth orbit and deep space, ranging from repairing communication satellites to assisting manned missions to the moon, asteroids, Mars and other corners of the universe, officials said. "However, these new vehicles are much smaller in size compared to the space shuttle, and therefore there is a need to adapt the robotic arm technology developed for the shuttle and the International Space Station," Ouellet told SPACE.com. With apologies to guitar-strumming former space station commander Chris Hadfield, Canada's most important contributions to spaceflight over the years have been made by its robotic Canadarms. The first Canadarm, a 50-foot (15 meters) arm attached to NASA's space shuttle, blasted into space in 1981. Until the last shuttle flight in 2011, the arm was used to move loads from the shuttle orbiters to the space station. Canadarm2 was sent into orbit in 2001 to aid in the assembly of the International Space Station. The 58-foot (17.6 m) arm, which Hadfield helped install on the station during a spacewalk, now takes care of much of the orbiting lab's maintenance work, supports spacewalks and captures so-called "free flyers" — spacecraft that must be grappled to the station, such as the commercial firm SpaceX's Dragon capsule. Canadarm2 is part of what is known as the Mobile Servicing System, comprised of the arm itself, the Mobile Remote Servicer Base System and the Special Purpose Dexterous Manipulator, also known as Dextre or the "Canada hand." The NGC program thus continues a rich history of Canadian space robotics. Developed for the CSA by MacDonald, Dettwiler and Associates Ltd. (MDA), the NGC system consists of two manipulators: a big one with a reach of 50 feet (15 m), and a smaller, 8.5-foot (2.6 m) arm. While the longer arm is the same length as Canadarm, it is much lighter and more compact, officials said. It is designed to be attached to future spacecraft, even small ones, thanks to a new telescopic boom capability with a three-to-one packing ratio. This ratio means that the deployed arm would be three times longer than its stowed configuration. When folded, it would take up less than 177 cubic feet (5 cubic m) of space — about the same amount as a minivan. The smaller manipulator prototype is a robot "handyman" — a possible future equivalent of Dextre equipped with gear designed to help fix satellites in space and support their refueling. "Many countries around the world now believe that Earth-orbiting satellites can be serviced robotically in much the same way that a car is brought to the garage for maintenance and filling up the fuel tank," Ouellet said. "The on-orbit servicing of the satellites is a great opportunity for the Canadian robotics technology and the Canadian industry." Although the Next-Generation Canadarm project is only a prototyping endeavor at this point, it is aimed at maturing technologies for future space applications. "There is a need to maintain the Canadarm’s technologies with the state-of-the-art," Ouellet said. "Indeed, the original Canadarm’s technologies date back to the 1980s (space shuttle arm), the '90s (Candarm2) and the early 2000s (Dextre), so many of the components that were used in the manufacturing of the arm are no longer available — in particular, the electronic components such as the CPUs and data transmission." "The upgrading of the technologies with the state-of-the-art represents a fantastic opportunity to enhance the capabilities of the robotic technologies and reduce the costs," he added. Follow Katia Moskvitch @SciTech_Cat. Follow SPACE.com on Twitter @Spacedotcom. We're also on Facebook and Google+. Original article on SPACE.com.